Q. How do I arrange an advisory session with my resource librarian? Our subject guides provide general guides on resources that are useful for your research and we generally hold group orientations for new users. 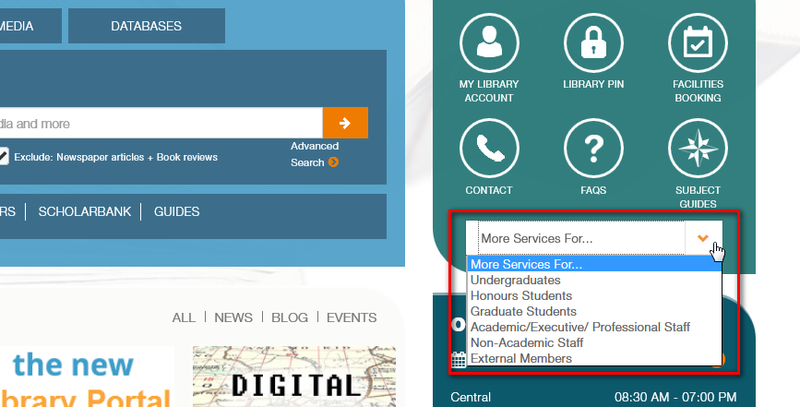 However if you need more specialised help, eg., for a honours thesis, you can consider requesting an advisory session with our resource librarians. Resource librarians are assigned to different departments, schools or areas and are familiar with resources suitable for different research areas. The request form to schedule an advisory session with your resource librarian is accessible via the Library portal. Click on the appropriate "More Services For ..." link. 3. Under Contact Us, select Schedule an advisory session with your resource librarian. When the form is submitted, we will forward your request to the appropriate resource librarian who will contact you shortly.